Latte: I continue to work on Catkin and Clapotis. Brewing: I made an ill-fated attempt to teach someone to crochet, which proved to me that knowing how to do something is not the same as knowing how to teach it! I think out loud about the complications involved in actually producing a knitted garment. If you have succeeded, please congratulate yourself! In this segment I mention Ysolda Teague's Little Red in the City and Maggie Righetti's Sweater Design in Plain English. Bite: Questions for you: What should I do with a pill, raggy looking sweater? I loved knitting Carol Sunday's Acorns but after one wearing, it looked like a rag. Corollary: How do you feel about Knit Picks yarns? Have you used Zauberball or similar singles sock yarn? How have these socks held up for you? I've been wanted to knit these Alchemist socks by Janel Laidman but I am somewhat leery about knitting socks with a singles yarn. Sofa: Alert! The second season of Call the Midwife is upon us, and the first season has just shown up on Netflix. Don't miss it! I talk about two non-knitting podcasts that I enjoy: A Way With Words, and All Songs Considered. I recommend the upcoming record (and the old ones too!) by Vampire Weekend. The new record is called Modern Vampires of the City, and the new track is called Diane Young. I also recommend the group Explosions in the Sky and an offshoot, Eluvium. The new record from Eluvium is called Nightmare Ending. Latte: I'm working on Catkin, Ben's mitts and I cast on a second Clapotis. 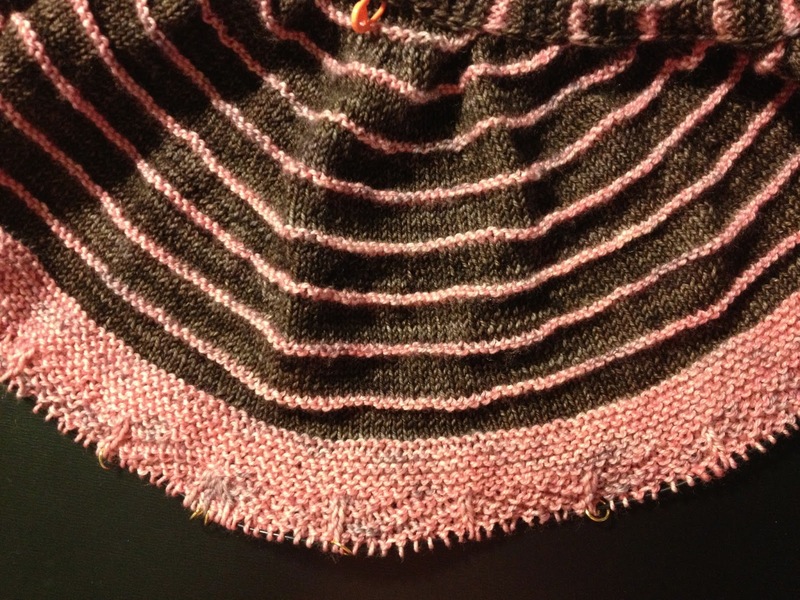 Grande: I finally blocked and sewed in the ends on Marin. I have issues with it. Brewing: I venture into Portuguese knitting with very mixed results. Taste: I review California Revival Knits by Stephannie Tallent and Fickle Knitter Design Volume I: Leaves by Michelle Miller. Please note that I was incorrect about Fickle Knitter being an indie dyer. 112 - No Snark for You! Just one small corner of the Yarn Boutique. This week, Abby welcomes back Guest Barista Susan, former host of Knitajourney Podcast. You can download Knitajourney episodes here. Latte: As always, Susan's knitting comes with a story. She is working on some argyle knee-highs for her husband to wear in the Brompton International Folding Bicycle Race. Abby is working mostly on Catkin and Ben's texting mitts. Grande: Susan made a Retirement Shawl for a colleague. We talk a bit about what makes someone "knit worthy". Brewing: Abby is frustrated at this point in her "lever knitting project". She's going to persevere, however, and see what happens. Susan has a yellow cardigan brewing, but also feels bitten by the sock bug and the glove bug. She is especially taken with Julia Mueller's gloves, and Abby concurs. Susan is aiming for 100 pairs of socks and gloves, and some of these will be made from hand spun. Abby confesses to an idiosyncrasy. We talk a bit about snarkiness and its shortcomings. Chai: Abby visited a new (to her) yarn shop - the Yarn Boutique in Lafayette. It's a fully (very fully!) stocked shop where you can dig around and find amazing treasures. Check it out when you're in the area! Sofa: Susan talks about a book called Girls Like Us about the exploitation of young American girls by pimps and other criminals. You can find more information here, here and here. Abby talks about Project Runway and her feelings about this season's "Team" theme. We talk about snarkiness some more. In passing, we mention Luther, Chopped, Hell's Kitchen and The Wire. 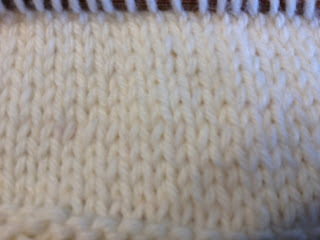 Latte: I'm working on Bright and Sunny, my SPAKAL sweater, Wingspan, Catkin and Ben's mitts. Brewing: I continue my experiment with trying to change the way I knit, or at least give myself some options. I took some advice from June Hemmons Hiatt's The Principles of Knitting and I will continue to work on my goal of improving my knitted fabric. I also am itching to cast on a beautiful pattern, Dreambird. Chai: Stitches was awesome, and a largely social event for me. I did, however, fall in love with Anzula yarn, and I wish I could find it either in stores or online more easily. I was excited to meet Brenda Petipa of Uptown Girl and Tribute sock fame and I'm now inspired to make another pair of the Uptown Girl socks. I love Half Price Books and if there's one near you, check it out! In the Berkeley store, I got the ice cream recipe book Scoop for a steal. Taste: I review a Two Skein project bag and Needle Nook from Slipped Stitch Designs. You can find a video about how to use the Needle Nook here. It looks like a pretty handy product, especially if, like me, you use circulars almost all the time. Sofa: I am trying to understand why I seem to be losing my mojo for watching Once Upon a Time and Revenge. I am, however, anxiously awaiting the new season of Mad Men and I continue to be amazed at the inventiveness and brilliance of The Walking Dead. My first try at lever knitting. Latte: I've been working on the Bright and Sunny (SPAKAL) sweater, Wingspan, Ben's convertible mitts and I have cast on Catkin out of Hazelknits Artisan Sock in Portabello and Pink Purl. I'm also getting ready to cast on Alewives out of Anzula Cricket in Candy Apple. Sitr: I continue to spin Crown Mountain Farms Superwash Merino in the color way Touch Me. Chai: Madrona was fabulous, and I urge you to attend next year! I took a walk to the Berkeley Rose Garden, but alas, not a single rose is in bloom at this time. Bitter Cup: I managed to get a Crystal Light stain on my Maia shawl. It leaked out of my wonderful Sigg bottle that I had failed to close all the way. Brewing: Ball winders: necessity? convenience? hinderance? What do you think? I love my Nancy's Knit Knacks ball winder, but I've decided to give it a vacation. TechKnitting has some interesting things to say about pulling yarn from a center pull ball You can read about it here. And - I want to improve my knitting. I'm trying to teach myself Irish Cottage Knitting and I've noticed that this experiment has had an effect on my "regular" continental knitting. I am not sure what will come out of the experiment, but I want to knit more evenly and a bit more tightly. Sofa: I recommend the book Gone Girl by Gillian Flynn, and talk about the TV show Scandal.